For a couple of months now we have been designing and developing a tool called TeamUp. It is still in an alpha stage. However, we decided to do a public “soft launch” because it is a working prototype that can be already tested in schools and other contexts where people are aiming to work together in several teams, so that the work takes place in a sequential sessions. 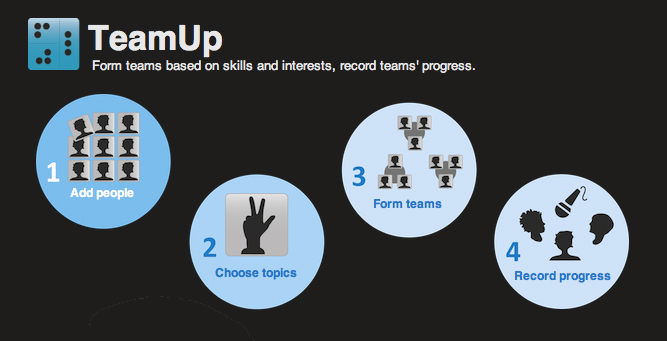 With TeamUp you may form teams based on skills and interests and record teams’ progress. Ward Cunningham, the developer of the first wiki platform described a wiki as “the simplest online database that could possibly work“. I think that in a way, TeamUp is the simplest collaborative software that could possible work. In here you may create new classroom, add people, play with it or take it in use (please, read the warning below). Warning: TeamUp is an experimental prototype and we may remove the service from the public internet without any advance warning. We also do not provide any guarantee on your data (e.g. the teams’ recording): all it may disappear at any point. This is a classroom with some people pre-added in it. This is a fast way to get an idea how TeamUp works. As it is a “public” service it can me a bit messy, as anonymous people are fooling around in there. if you want to study TeamUp technology, you may want to have a look of the source code. Most content is licensed under some OSI approved license. If you want to write some code, let us know. I must document this, too. We were having the circles before the Google+ was released. TeamUp is designed in an European iTEC project. It is an early result of probably one of the most profound design process ever carried out in the field of educational technology (let me know, if I am wrong). Behind the design of TeamUp there are: creation and analyses of 19 scenarios of the future of learning, created with various stakeholder and experts working in the field of education and 11 Participatory Design workshops with teachers in 10 European countries, naturally carried out in the local languages in authentic environment. On top of this we also have organized three Focus Group sessions with teachers to confirm some of our interpretations and design decisions. With this size of investment to design one could expect more than a web widget for creating teams and recording audio clips. I agree. There are other results from the process, too. We have recognized 28 design challenges (16 design opportunities), 13 learning activities and 6 learning stories that echo scenarios of future classroom. We also have two other tools in a stage of early prototype. More information is available in a the Report on Design Prototypes and Design Challenged for Education. To see functional tool prototypes you still must wait. PS. You may also contribute to the open source software development. If interested in, please, contact. Posted in Design, educational tool, Social Software. I think there is a network element in the TeamUp, too. Teams in TeamUp can be more or less “networked” with each other or with other groups or individuals. The team may decide on this themselves. Being a Web application one may also “invite” people to the team with an URL. Now when thinking about the network use of the TeamUp (because of your comment, thank you!) there probably should be “embedding” in the teams level, so that one could have it in whatever website / intranet etc. where the team is working online. Good teams (groups) are networked. Previous Post Back to school: new technologies, more advantage communities ?